For everything from helmet fittings to coffee while you wait on repairs, these Philadelphia bike shops have you covered. It’s been said time and time again that Philly is an ultra bike-friendly city. You’ve seen the proof: On your commute, you’ll likely pass dozens of locals zooming down bike-lane-lined streets. Maybe you’re one of these city bikers or maybe you want to become one. Either way it all starts somewhere: at a bike shop. Whether you’re an old pro at city biking or you’re just dipping your toes into the pool, here are eight local bike shops that will do everything from servicing your current wheels to helping you find the ride that’s the right fit for you. Go here for: The unbeatable service plan: Every bike purchase comes with lifetime service assurance. Breakaway owner Glenn Krotick has a store stocked with the top bike brands, such as Trek, Specialized, and Cervelo. Every bike purchase comes with what they call a “silver tune,” which is essentially lifetime service for the bike (as long as it’s still with its original owners). The shop also provides RPM indoor cycling classes; you bring your bike, clip into a computerized system, and race your classmates. Despite some fancy racing models, commuter bikes remain the top sellers — confirmation that novices are more than welcome. Go here for: The life-long relationship. This Manayunk-based bike shop (which will be relocating this spring to the Manayunk Crossing Shopping Center) will surely service your pre-owned wheels, but the real perks kick in when you choose to buy your ride from them. Because your bike will need some TLC from time to time, Cadence offers a free Basic Tune annually for the life of the bike, where they’ll tune, wipe down, and lube up your bike. Plus, Cadence aims to be an all-inclusive hub in the Philadelphia cycling community; aside from retail and service, they also offer spin classes at their indoor studio as well as race coaching and lab testing for avid riders. Go here for: The ideal upcycled ride. Here, you’ll find mostly refurbished (read: wallet-friendly) rides; owners Monica Pasquinelli and Sam Davis scoop up cycles at bike swaps all over the northeast, then turn them over to their expert repair crew. In 2012, they purchased Main Line mainstay Wolf Cycles, which means more room for new lines from Linus, Jamis, KHS, and more. To add some convenience to your bike-buying process, you can get bike recommendations over the phone and purchase one via PayPal. Go here for: No frills service on your single-speed or fixed-gear bike. This rider-owned and operated shop is all about the bike life. They specialize in single-speed and fixed-gear bikes but also dabble in hybrid and flat bar road bikes. It’s also worth noting that this impressive shop also designs and builds bikes — they’re currently selling their own design for Biria, which is their first bike made exclusively for the American market. Go here for: Amenities — like a cafe — while you wait for your repair. Established in 2012, this community-based bike shop is striving toward change and progression in Philadelphia — North Philadelphia, to be exact. Kayuh focuses mainly on bike repairs but has some brand-spankin’-new bikes in their shop for retail sale. This local shop aims to give a home-y, unpretentious vibe to their customers who are able to benefit from monthly repair clinic workshops and Sunday group rides. Plus, the shop features an in-house cafe that serves up everything from bagels to lattes while you wait for your repair. Go here for: Commitment to riders of all skill levels. There’s a reason Keswick is a perennial go-to: Its two locations allow for a vast back-stock. They carry every Specialized and Trek under the sun, along with electric bikes and triathlon bikes. No matter what your skill level, the salespeople (many of them former customers) just want to get you safely on the road. Staff members ensure that helmets fit and review the rules of the road — which are probably more likely to stick coming from a cool bike dude. Go here for: The fun, flexible service. This neighborhood shop is stocked with the likes of Kona, Specialized, and Giant bicycle brands for purchasing (and test driving! ), but also provides service for your current ride ranging from tune-ups and flat fixes to minor adjustment, and overhauls. The shop’s guard dogs (aka snuggle bunnies) will be there to greet you and lend a paw if you have any questions or concerns throughout the process. Go here for: The unique finds. For more than 20 years, Via was a community staple in the Bella Vista neighborhood of Philadelphia. 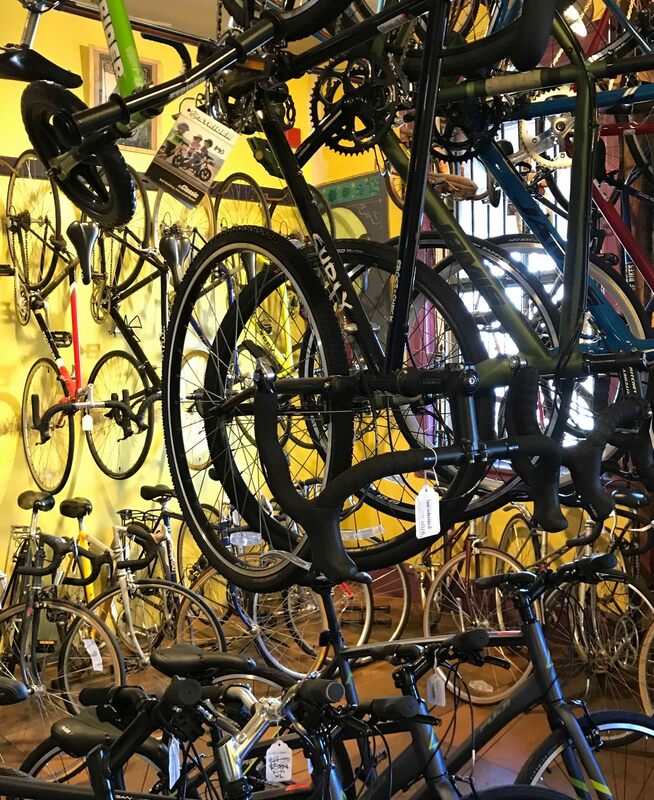 After a move in early 2017 to the new Broad Street location, the shop lost about half of the space they had in their previous location, but you better believe they are still tinkering away on used bikes to reliably repair for Philadelphians. Via is home to an extensive collection of unique and rare bicycles (like the one-of-a-kind Fred DeLong Schwinn Paramount), as well as a large array of parts to help collectors outfit their vintage rides. Additional reporting by Bailey King.